There appears to be much confusion as to what exactly identity fraud is , there appears to be a general expectation that the identity of one person is used by another and that there is a theft of information. Whilst there is no doubt that identity theft happens it is actually a lesser issue than being a victim of Identity fraud where by you trade or inter act with some one who used a name other than their own for the purpose of obtaining a benefit. An identity does not have to be stolen from some one in order to be used. It can simply be created and it is often a credible sounding name which makes people believe that such a person or organisation truly exists. It was the name in which an application for funding in October 1999 and money was obtained . It was the name in which a formal application to the minster was made in November 1999 by virtue of section 121 Animal welfare Act for Animal welfare institute of New Zealand to obtain “ approved status “ which brings with it wide sweeping law enforcement ability. It should be noted that the act says that he application has to be made in the name off the applicant. You just have to wonder how something which does not exist can be an applicant. In 2006 when no identity could be found for AWINZ (and therefore no accountability) we set up our own AWINZ his one was legal because it was registered under the charitable trust act 1957 which confers Body corporate status and make the name that of a legal person it was explained to Neil Wells By The Ministry of economic developments . We were then told we would be sued but it was not those people who sued ,it was Wyn Hoadley Graeme Coutts and Neil Wells who now claimed to AWINZ but had no proof that they were. Later Tom Didovich the man who had originally obtained the witnessed the signature on the original deed signed a deed with Hoadley , Coutts and Wells in December 2006 , this trust then claimed to be the same as the previous trust . By now you should be suitably confused and hopefully see that identity in New Zealand is a complicated issue. Banks are starting to get it ,but slowly. I actually found a bank account in the name of Animal welfare Institute of New Zealand at the national bank , it had no trust deed, was not a trading name and held public funds. Only Neil Wells had access to this account , in my mind that proves to me at least that AWINZ was at all times a trading name for Neil Wells. Our Identification practices are less than slack , our accountability to the truth is non existent But New Zealand is not corrupt…Perhaps its because we cannot identify those who are corrupt because they are hiding behind some name which can be any one at any time . You may sa why blog about it why not take it to the police or some where.. well I have I have tried for 4 years to get accountability but this seems so well entrenched that it is being protected at the highest level . We need more transparency and accountability . I make this Official information act request with regards to those who are involved in the production of our legislation. I will illustrate my request with a real example to substantiate the fact that this is not a hypothetical matter and is very real. 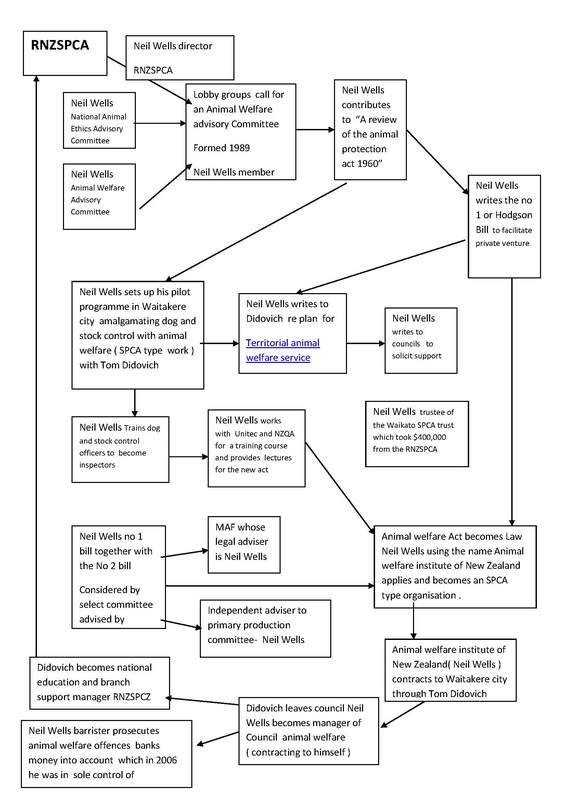 In 1996 a former RNZSPCA director drew up a concept to integrate the statutory provisions of local bodies, being dog and stock control , with animal welfare services traditionally provided by the RNZSPCA. He had already initiated this concept though a pilot programme with Waitakere city council and wished to take the service he called Territorial Authority Animal Welfare Services nation wide. The document locatable at the hyperlink above shows that this was clearly a commercial venture. In the years which followed Neil Wells volunteered to write the no 1 bill for the animal welfare act this was reported in a parliamentary release The next Animal Welfare Act – Pete Hodgson Speech29-06-2001 . The bill went before the select committee and Neil Wells was employed as an independent consultant to the select committee. At this time he was also a Legal consultant to MAF in relation to the development of the animal welfare act and at the same time was communicating with them with regards to his own personal ambitions . When the act was finalised and about to become law Neil Wells applied for AWINZ ( animal welfare Institute of New Zealand ) to become an approved Organisation under the act he had been so heavily involved in. AWINZ eventually became an approved organisation under the act despite the fact that it had never been incorporated under the charitable trust act nor had a trust deed been sighted . In 2006 I had cause to question AWINZ and it was only then that a trust deed , which could very easily have been retrospectively signed, materialised. This was dated 1.3.2000 proving conclusively that the statement in the application to the minister, being that a trust deed existed on 22 11.99 was false. The reaction for questioning the accountability of the organisation was over the top and I was sued by three people who claimed to be AWINZ but were not supported by a trust deed and were not the same group of persons who had signed the deed. This group of persons then represented themselves to be the approved organisation and later were joined by another , they subsequently signed a trust deed and pretended to be to be the same trust as the first . I have recently made submissions to the select committee with regards to increased penalties in animal welfare. Have very little accountability cf private investigators, mortgage brokers, real estate agents. I suggested to the select committee that this lack of accountability my be due to the fact that the person who had such a high degree of input had a vested interest in the act, in that he was going to use this act as the foundation of his own business venture. What policy provisions are there to safe guard against the conflict of interest where by a person can be involved in writing legislation which he proposes to use himself. Has Mr Wells at any time thought his involvement of writing the act, employed as a independent advisor to the select committee ,and as legal consultant to MAF declared a conflict of interest, if so please provide copies of these documents if you have access to them and where would these documents be found if they existed. The animal welfare act has very little accountability for inspectors who are private individuals and have wide sweeping legislative powers . Do animal welfare inspectors have any accountability to the auditor general because of their delegated authority ? Where do we find a register of those warranted as animal welfare inspectors. Do council staff volunteering their paid time as inspectors have accountability to the auditor general through their council positions? i. If so and given the fact that it was considered Ultra Vires for council to enforce animal welfare legislation what has the auditor general done with regards to this conflict in duties. With regards to government departments and local authorities contracting to an unincorporated Trust ie a trust which itself is not a legal person but can be a legal person if it is registered by an enactment which confers body corporate status. When entering into an agreement with unincorporated trust what provisions do policies provide for one person to sign on behalf of others . What policy is there that enable local or central government to enter into an agreement with a trading name? What are the expected steps of verification which are laid down for councils and government departments to verify that they are entering into an agreement with a legal body, i.e. one capable of suing or being sued. What policy exists that would allow a person , contracting to central or local government , to represent themselves as being a trustee if their name does not appear on a deed. i. What legal authority does such a person have in terms of government contracts. iii. And the legitimacy of AWINZ as a law enforcement authority for enforcing of animal welfare legislation. Please provide copies of all reports , research , notes references and policies which have investigated or examined. The issues arising out of organisations enforcing the law for their own pecuniary advantage. The issues and consequence of accountability of contracting law enforcement to a trading name . Accountability issues of private law enforcement bodies. Cost benefits analysis of use of private law enforcement bodies. What policies are in place for a managers of a city division to use the logo which is on their building to collect revenue by way of donations from the public they serve the example I use is the document located at this link which shows the city logo and the logo which Waitakere City animal welfare uses and is shown on their building. Funds which have been raised from the public have been used for prosecuting me in order to silence me to prevent me from asking the questions which I continue to ask. Please advise if there is a policy which deals with the use of public funds by a manager of a city council in this way. i. The documents are located at http://www.charities.govt.nz/ search animal welfare institute of New Zealand the annual reports show that over the past three years $105,366 of charitable funds have been used on litigation . The only person who stands to gain from this personally is the manager of animal welfare Waitakere city who contracts to himself as a trustee of AWINZ – Please advise of any policies which facilitate and condone this. Prosecutions – Animal welfare prosecutions are carried out By Barrister Mr Wells for the CEO of AWINZ Mr Wells who has matters reported to him by the manager of Waitakere city council animal welfare through a MOU this person is also Mr Wells . Please advise of any policies which facilitate this and advise why this is possible . What we do at Animal Welfare Waitakere? Animal Welfare Waitakere provides a range of services, all directed at improving welfare standards of the animals in our community, educating the public in a better understanding of animal welfare and of-course finding good suitable homes for those animals less fortunate, abandoned, neglected and unwanted. Please advise the policy and the process through which this territorial body can undertake the duties described with regards to duties other than the statutory duties of council being dog and stock control. Since when have council officers been able to be involved with animal welfare work . Which other councils have dog and stock control officers who are also animal welfare inspectors under the animal welfare Act. Finally please advise why it is not seen as a conflict of interest for one person to wear the hat of manager, contractor barrister and banker of funds for the work which council paid staff carry out. Why does the United nations Convention against corruption define this as a corrupt practice and why is it condoned in New Zealand. I note that I could have been asked to resubmit my submission but chose instead to avail themselves of something which was not written in the rules. It is in the publics interest that the matters raised in the submission are considered because the public need to have the events which I described mitigated. It is apparent with hindsight that Wells had self serving interest at the time that he was an “ independent “ advisor and therefore was not Independent. I have no doubt that Mr Wells would have lobbied for these Higher penalties which are now being considered. I believe that I make very valid points with regards to the lack of transparency of the enforcement of Animal welfare law and it has to be of note that Mr Wells contributed significantly to the Mens Rae component being removed form the legislation making animal welfare offences strict liability .. you own the animal , it suffered you are guilty.. no defence . Now we follow that with lets increase the penalties. Since posting my submission on my blog I have been approached by persons internationally who have concerns about the wide sweeping powers of animal welfare inspectors and the high penalties which are applied to persons who love their animals and are deemed because of the lack of the intent provisions to be allowing their animals to suffer. It appears that those with money are being targeted to supplement the income of animal welfare charities world wide. It is not about animal welfare it is about revenue collecting. The evidence I provide is relevant. I would like my submission to be dealt with in accordance with the rules ,I cannot help that my submission contains serious allegations they are the truth ,they are factual matters and matters which should be taken into consideration by a country which is perceived as the least corrupt. the benefit to the committee of hearing such evidence. your submission from its permanent record in accordance with Standing Order 232. Four years ago I asked questions about an approved organisation Animal welfare institute of New Zealand (AWINZ)as a result I have been hauled through the court it has potential of costing over $250,000 and it has destroyed my family. In the words of transparency international.. corruption ruins lives fight back .. I have but corruption in animal welfare funded by the public purse and private prosecutions has been a task too big for me. In 1999 Mr Neil Edward Wells Barrister who wrote the first bill for animal welfare Act 1999 and had seen its passage into law through his employment as independent advisor to the select committee , applied to the minister of Agriculture for the Animal welfare Institute of New Zealand (AWINZ ) to become an approved organisation by virtue of section 121 Animal welfare act 1999. I am a former Police Sergeant and am now a Private Investigator and member of the Certified Fraud examiners association. In obtaining evidence for my defence I have obtained documentation which proves the following documents are attached as they appear below. Whilst Mr Wells was employed as an independent advisor to the select committee he continued to communicate with Tom Didovich and passed on information which was not in the public realm, to over come the hurdles which would prevent territorial bodies form having an animal welfare role 17 September 1998. The significance of registration under the charitable trust act is that it makes the trust which other wise no more than a group of people with a common purpose using a trading name , into a body corporate( legal person ) which has perpetual existence , can sue and be sued . It should be noted that it takes just a few days to register a trust under the charitable trust act if the application complies with the act. In the period between August and November the trust would have been incorporated if the statement in the August notice of intent was true. In 2006 neither MAF nor Waitakere city council had a copy of the trust deed for AWINZ and there as no record of it being incorporated under any act. With others I formed a trust called the animal welfare institute of new Zealand and we succeeded in registering it under the charitable trust act there by proving that no other legal person by that name existed. We were threatened with legal action and were told to give up the name and our web site which expressed our concerns about the unidentifiable law enforcement agency which had wide sweeping powers. We asked if we could meet trust to trust to resolve the issue but Mr Wells and two other persons who were not the same group as those named on the deed ,sued me in an attempt to silence me and make us give up the name so that they could commence a cover up . These three people later combined with Mr Didovich the former manager animal welfare Waitakere City ( who had witnessed and collected the signatures of the trustees for he alleged 2000 deed ) to sign a trust deed and form a charity in 2007. Mr Didovich also plays a key role in the RNZSPCA and Mr Wells is also a trustee of the Waikato SPCA trust which has taken over $400,000 charitable funds from the Waikato branch of the RNZSPCA , then dropped the corporate trustee RNZSPCA off the deed and then formed an entity in its own right.. Evidence of this is available form public records Societies register and charities commission. I will happily provide more evidence on this if required. I have been held in the courts for nearly four years now the court has been misled and manipulated and I was denied a defence, no evidence has ever been presented by Mr Wells who has used his victory in court to portray me as a person who is obsessed in pursuit of him . My pursuit has been for justice and the fact that I questioned what I saw as a corrupt practice and I have been persecuted for it. As manager Animal welfare he is both parties in an MOU with AWINZ . The dog control officers “volunteer” their services to AWINZ while on full council pay. ( 5 Jan 2000 ) Most are not aware of the significance of their double role. AWINZ operates from council premises but council deny this email 8 May 2000 wells claims he leases the premises for $1 per year but the council letter 11 march 2009 par 13.AWINZ claims they do not operate from the premises. AWINZ uses the same logo as displayed on the council building for public fundraising sent out with dog registration except that it has the words institute of New Zealand written below the animal welfare sign. This lady inherited her mothers elderly dog it had arthritis. Her mother had passed away tragically one month before Waitakere dog control officers picked it up from her back yard. She phoned dog control in an attempt to recover the dogs body so that she could have it cremated and interred with her mother. The matter was reported to AWINZ Mr Wells who approved the matter for prosecution. Mr Wells Barrister sought diversion for a donation to a trust which neither existed nor was charitable and money was paid into a bank account in the name of Animal welfare institute of New Zealand, which was under the sole control of Mr Wells. This young man had a dog with Mange. He went to the vet and got medication. The dog had a relapse and he went back to the vet who would not give more medication due to the boy’s lack of funds. When he arrived back home the dog jumped out of the car and sought refuge under a nearby house. When the boy could not get the dog out Waitakere dog control were called . Mr Wells of AWINZ passes it to their barrister Mr Wells who prosecuted the matter before the court and had $398 reparation ordered. I have good reason to believe that these are not the only prosecutions however these are two which I can conclusively prove , it should be noted that in both cases the time of the offending is over allegedly a two month period and prosecutions were commenced 6 months after the last date of the alleged offence. The offences under the animal welfare act are strict liability , so even if the persons had a good defence it is hard to produce evidence after 8 months after the first date I, it is ironic that in two prosecutions so far apart the pattern is so similar. There is no knowing how many prosecutions actually occur and how many “ diversions” for donation are given , nor is there any ability to see where the money goes. Animal welfare legislation is already harsher than anything pertaining to abuse of children. I use the following example. A mother who happens to be a GP went skiing her son complained of a swore leg after a fall. Because he could weigh bear on the leg he could ski on it. The following week it was discovered that the leg was in fact fractured. Had this been a dog she would have been banned from owning another animal and she would not have had any defence open to her. The offence being complete when she failed to recognise that the leg was broken. Animals should not have greater protection than children and there should be an “intent “ ingredient brought back in the legislation . Most pet owners who see their animal hobble in won’t dash off to the vet, just as parents whose child complains of an ache won’t necessarily dash off to a doctor. The injury is often assessed over time and frequently by the next day the animal is fine. The risk for pet owners is that if an over zealous animal welfare inspector seeking to line the pockets of their “ charity “ intervenes the owner is charged on the sole basis that the inspector thinks the animal is suffering. There is also the matter of costs of vet bills. The charity which we had set up, which Mr Wells effectively destroyed through litigation, was set up with intent of helping owners of injured animals with financial assistance which could be repaid later. People bond with their animals and just as you would not put your child down if their leg needed amputation or pinning it is often a decision which cash strapped owners face. There was a time when the RNZSPCA used to help with such matters now with the “ charities” being run as businesses it appears to be about collecting money and not about providing service . Mr Wells has probably the best set up of all unlike SPCA’s he has no overheads , he uses the councils premises, staff ,vehicles ,resources and even uses council phones and email addresses and logos. He Sends out donation form with dog registration and possibly also prosecutes in council time. The only administrative task left over is counting money and depositing it in the bank account he in 2006 had sole control of . Several RNZSPCA volunteer inspectors have confided in me that they are concerned with the wealth that is being acquired within the RNZSPCA and the corporate wages being paid at the top. I believe that animal welfare has become not a matter of service but a money making venture and I support this with a poster which Mr Wells had on file in Waitakere city .There is profit in animals . I am a former Police prosecutor and am aware of the economics of prosecutions. A lawyer charges $350 per hour so any penalty or diversion of less than three hours lawyers wages is more economical to pay than to defend . In our cash strapped society it is money which dictates the plea. Middle income New Zealand have no right to justice to defend a simple animal welfare matter would cost several thousand dollars. Added to this is the fact that there is no defence is possible any way because it is the opinion of the welfare officer if the animal was suffering. More transparency and accountability of approved organisations -those who do the enforcing should be squeaky clean. i. This is the only legislation which is enforced by private citizens. ii. There needs to be independent assessment of every animal welfare charge before it is sent to the court no one should be able to wear all the hats as in the case of Mr Wells. iii. Authority to prosecute should be obtained through MAF . iv. Auditing and spot checks by independent assessors to evaluate those prosecutions are not being taken unjustly. Heavy penalties for abuse of this process. v. Those who enforce need to be held accountable to truth honesty and transparency. Giving Private trusts the ability to enforce the law is like giving an open cheque book especially when they cannot be held accountable as in the case of AWINZ where the “approved organisation” effectively does not exist . Penalties for making false claims as to approve status. i. The penalty for making a false statement for the purpose of establishing an approved organisation should be a prison term . ii. No organisation should be approved unless a statutory declaration has been filed,( Which would bring its own legal protection ).And some one has checked to see if it exists beyond paper. we appear on a publicly available database so our licence can be verified at any time. But animal welfare inspectors who have wide powers are not subjected to these controls and have no real process of individual accountability other than to the approved organisation which recommended them and the average person would no know where to begin to look. There is no independent accountability of animal welfare officers , no process for disciplinary hearings and it would appear that as law enforcers and being civilians they have all power and very little accountability. As has been shown in the case of AWINZ , there is no transparency or accountability to the enforcers and consideration should be given to a complete review of the way animal welfare legislation is enforced. I have further concerns with respect to the confusion of the SPCA and he RNZSPCA , those in the RNZSPCA claim that the SPCA is different and the SPCA claim that they are not the RNZSPCA, so where do they get their legal powers from, only the RNZSPCA is an approved organisation . Every one of them is chasing the dollar if they really cared about animal they would provide treatment and assistance to those who love their pets but are financially embarrassed. The current system is easily be abused and there is no accountability for the fines which can very easily disappear into personal accounts and to that end all animal welfare fines should be paid into a public purse so that those who care about animals act for their concern for the animal and not act out of pecuniary advantage. I am happy to make personal submissions on this matter and assist you with information for any investigations you deem necessary. I am a verification specialist and will be happy to assist in setting up a system which will make the enforcement of animal welfare more transparent accountable and just. Asking a law firm to do work pro bono is one thing but there is another way which is a win win for law firms and the barristers who are taking legal action through that firm. It is called funding the litigating through Charitable public funds – this is how it is done. You have a dark secret which is about to be exposed so you need to find a way to silence those exposing you . You get law enforcement powers though this “ trust’ but being an independent person you don’t want to trouble the other trustees with things like meetings. Some of the trustees are society ladies and their names look good being associated with an animal welfare group but they are really better at bridge, they don’t understand what a trustee is supposed to do. So when things get sticky 7 years later and after some ones moggy was illegally euthanized by one of your so called Volunteers who are really council paid dog control officers ,some one starts looking for accountability and finds none. So when the questions get to tricky and the people are asking embarrassing questions in parliament , from Waitakere city council , MAF and the minister something has to be done to silence those who could blow your whole game and heaven forbid discredit you for your actions. The people doing the questioning in the mean time have formed a trust in the identical name ( look up ANIMAL OWNERS SUPPORT TRUST previously Animal welfare institute of New Zealand ) and have legally registered it on the register of Charitable trusts . This now proves that you were not being exactly truthful when you told the minister in 1999 that a trust had been formed and was being registered , because it only takes a couple of days to register trust but you know that because you have registered others previously and since. Now this trust deed is an agreement between those four people and not any one else, Being unincorporated it has no perpetual existence. Then there is the minor matter that the trust deed says there will be four people now we suddenly have two .. You need to cover up fast- Confusion is always a good tactic . So another Barrister is approached one who is held in high esteem QSM, former Mayor and had past involvement with animal welfare. Then Wyn is made chairwoman and solicits donations which are sent out with the dog registration in Waitakere city using a Logo which is not unlike that on the building where Waitakere city council run their pound from . We know that the animal welfare Institute of New Zealand does not operate from those premises as the council solicitor has told us at least twice that they don’t. Then Wyn and another barrister and a JP called Graheme Coutts take legal action after intimidating phone calls by the their lawyers wife .. Vivienne Parre ( Wright ) now Vivienne Holm of Bell Gully failed to have the desired effect. They claim passing off and breach of fair trading …now hang on didn’t Wyn start using that name after the legal entity she is attacking was set up? They turn down the offer to disuses resolution and see suing as the only way forward , so the other Barrister throws in defamation for good measure because he didn’t like the idea of people pointing out the untruth of the statement to the minister and questioning accountability when it comes to using public funds . So Nick Wright Viviennes husband gets Brookfield’s to take on the matter and David Neutze puts his name to the statement of claim without checking to see if AWINZ really has a claim. I have copies of a total of $99638.22 in invoices made out to AWINZ. Now AWINZ is an acronym, it stands for the Animal welfare institute of New Zealand. If Brookfield’s tried to recover the debt from AWINZ they would fail as at that time there was no trust deed and only those who comprise AWINZ can consent to a debt being incurred , AWINZ could not enter into an agreement in that name and could not sue or be sued in that name. Yet this leading law firm writes invoices out to it. 27/04/2006 AWINZ incorporated by appellant and fellow trustees Highlighting that there is o other legal entity by that name. 10/05/2006 Wyn Hoadley allegedly becomes a trustee of AWINZ but has no trust deed , We are told that Nuala grove and Sarah Giltrap have resigned. 14/08/2006 Didovich, the former manager animal welfare Waitakere becomes a trustee there still is no trust deed – He is the man who approved payment for the trust to be set up using council funds he also witnesses and gets signatures for the 2003 deed he lost his job at council and Wells took his job . See a samples here note the first invoice dated 2006 was amended to read 2007 , is this what law firms do? The financials posted on the charities web site show that the charitable funds were used for litigation but discussion could have resolved everything why discuss when legal action using public funds can be so effective. Also refer to the Email asking for mayors and see if you can find proof of the assertions made in that email – where is the income where is the expenditure where is the transparency the accountability? Please don’t hesitate to contact me if you have any observations .